US LED luminaire manufacturer LumenFocus launched a series of lighting solutions designed for the facilities of the food and meat industry. The Altor series has two luminaires – the WVLF and the NVLF. 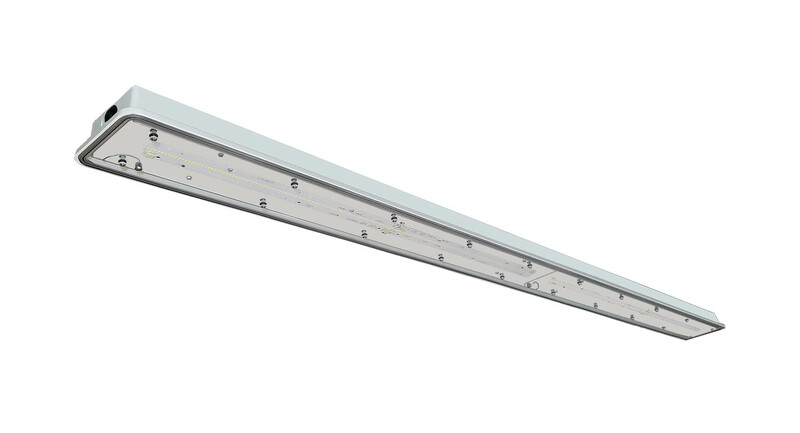 The WVLF is a wide profile LED vaportight high bay. The NVLF is a narrow profile vaportight high/low bay. Both luminaires have been engineered to be bacteria and debris resistant, with minimal external features that limit particulate accumulation. The flat polycarbonate lens, available in clear or frosted polycarbonate, provides a true water seal that will allow no condensation into the fixture. The luminaires are available in different sizes and lumen output to meet customized request. The Altor series is driven by high efficiency LED light engines. The NVLF is capable of efficacies up to 135.2 lumens per watt. Its wide counterpart can reach 138.2 LPW. Both the NVLF and WVLF boasts predicted L70 lifetimes of greater than 72,000 reported hours. Both will provide high quality, efficient light for many years to come. The NVLF is available in 3500K, 4000K and 5000K. The WVLF is available in 3500K and 4000K. And the products are made in the USA at LumenFocus’ Henderson, NC facility.